There are several bills we are now tracking within the Kansas Legislature. There are two that we need your assistance on now that we would like you to take action on and be praying about. Prayer is key! SB 85, known as “Simon’s Law,” would enact new statutes regarding life-sustaining treatment for patients younger than eighteen years of age. Parental consent under this bill is required before a do-not-resuscitate order is issued by medical professionals. This bill is needed. There have been incidents in the past where doctors have put a do-not-resuscitate order on the records of a child without the parents’ consent. Statues: SB 85 is in the Senate Committee on Federal and State Affairs. I testified yesterday before the committee on this bill. Please Pray: Pray the members of this committee will stand up for the rights of parents to protect their children. Based on the comments and questions asked throughout the hearing, the committee appears to be in favor of passing the bill. A vote is expected any day on SB 85. Take Action: Contact the members today on the Senate Committee on Federal and State Affairs. Ask them to vote YES on SB 85. Be sure to let them know that you are a member of Concerned Women for America of Kansas. HB 2171, student privacy and protection act. Every public school student restroom, locker room, and shower room accessible by multiple students at the same time shall be designated for use by male students only or female students only. Statues: HB 2171 is currently in the House Committee on Federal and State Affairs. Take Action: Contact the members of the House Committee on Federal and State Affairs. Urge them to vote YES on HB 2171. Be sure to let them know that you are a member of Concerned Women for America of Kansas. Please Pray: Pray the members of this committee will see the wisdom of this legislation and vote to protect our children’s privacy. Rep. Trevor Jacobs (R-District 4) believes we should have legislation that goes further than schools. 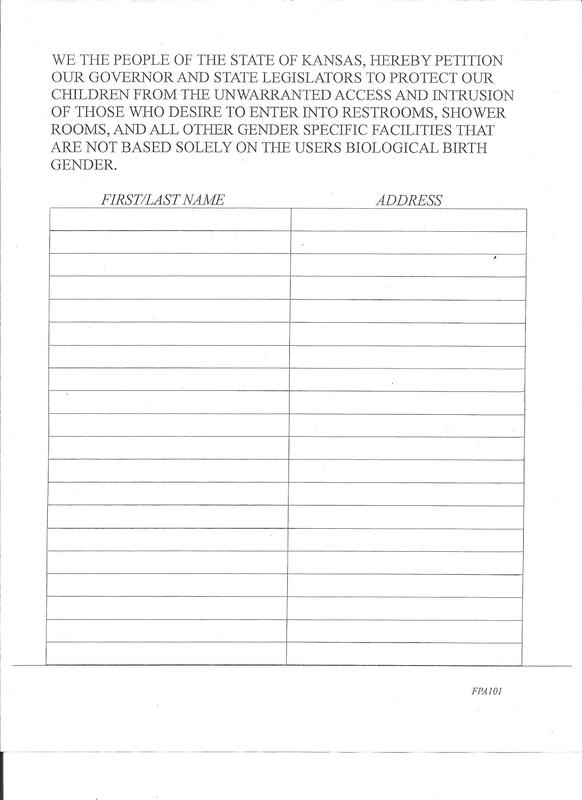 He has started a petition to protect children from the unwarranted access and intrusion of those who desire to enter into restrooms, showers, and all other gender-specific facilities that are not based solely on the user’s biological birth gender for the whole state. Take Action: Please read, sign, and send Rep. Jacobs’ petition to Honorable Trevor Jacobs, 1927 Locus Road, Fort Scott, KS 66701. If at all possible, please have others sign it, too, before sending it in. We have many other bills that we are tracking and will alert you to as soon as there is an opportunity to take action. For now, please pray against plans behind the scenes concerning legislation on physician-assisted suicide and “sexual orientation.” Thank you.